Now that the weekend is over, you're probably wondering what exciting fashion-y events are happening, right? Right. Good thing our friends at the Bold Italic are creating exciting events for your social calendar. 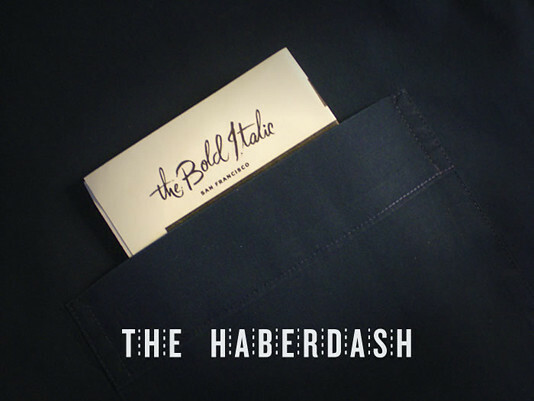 In their continuing goal to improve our lives through community, they are putting together SF's first Men's Fashion Week - The Haberdash (August 23-29). Come to the party on Wednesday, August 25th, at the Burritt Room and brag to others that you were there from the start. They have a slew of other events this entire week, so make sure to put those on your calendar as well. And, in case you feel like rsvp-ing on Facebook. Tickets: $15. Includes two complimentary cocktails from Distillery No. 209. MONDAY From 6-8 p.m., Revolver will be pouring free beer, offering 30% off select items, and hosting an art opening for Jesse Pollock's new photo zine "Guys" as well as a performance by Namesake. TUESDAY From 6-8 p.m., On The Fly will host a free scotch tasting and offer 25% off any single-priced item in the store, including Wolverine boots, shaving tools from Truefit & Hill, and leather bound flasks. THURSDAY From 6-8 p.m., Jack's San Francisco will be giving out free beers, offering 50% off top designers and 30% off of premium denim, and playing host to a Taylor Stitch pop up store with custom fittings. FRIDAY From 7-9 p.m., Candystore Collective will pour free beer, offer 30% off of select items, and celebrate cafe racer and vintage motorcycle fashion with a pop up store from Falcon & Snowman. And of course, ALL WEEK, get deals when you mention "The Bold Italic" at AB Fits, Acrimony, Azalea Boutique, The Barber Lounge, Candystore Collective, Cary Lane, Chrome, Hlaska, Jack's San Francisco, Nomads Clothing & Accessories, On The Fly, PACT, R.A.G., Revolver, Self Edge, Taylor Stitch, and Unionmade. Click here for a complete run-down of the deals being offered. The above events are 21+.